Tomorrow, Mon 3rd Dec 2018, St Margaret’s House in Bethnal Green, are holding an evening of vocal music. The Voice Energy project, who rehearse in St Margaret’s Chapel and perform across London will be performing. Joining them on the night will be Veda Slovena, a mixed-voice choir specialising in traditional Bulgarian music, Reinis Jaunais – a virtuosic solo guitarist, and N.U. – a girl trio performing Hip-Hop and R&B vocal harmony. The concert is in the Cafe at St. Margaret’s House, 21 Old Ford Road, London, E2 9PL (photo above). It’s just north of Bethnal Green tube. Beirut based artist, Lawrence Abu Hamdan, was asked by Amnesty International (and others) to investigate the Syrian regime prison of Saydnaya. It’s believed 13,000 people have been executed there since 2011. When you walk into the gallery you are facing the door to a big sound booth. When you step inside it is almost totally black, like the situation the prisoners face. When I stepped in I heard the words: “There isn’t a single voice to be heard throughout the entire building. If they are killing someone, you’ll not hear their voice, all that can be heard is the sound of the whip.” And there’s more, lots more. This is scary stuff. Abu Hamdan interviewed the few survivors. He also designed and sourced objects derived from legal cases. This installation at the Chisenhale Gallery is now only open between 12 and 6pm from Weds to Sunday 9th Dec , when it closes. There is a Curators Talk and Late Opening on Thurs 6th Dec. This talk is free to attend but booking is recommended here. 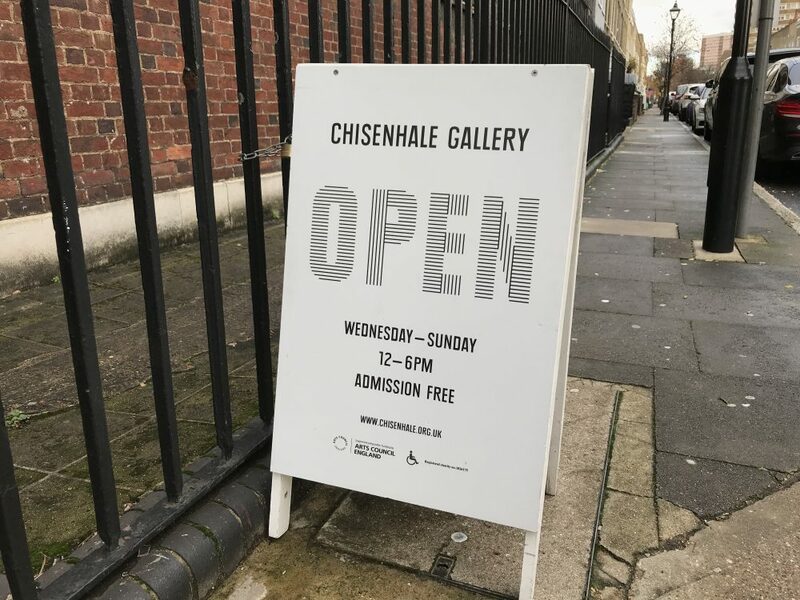 Chisenhale Gallery is at 64 Chisenhale Road, London, E3 5QZ. Painting the Hamlets is a display of paintings from the boroughs collections which depict landscapes, river views and street scenes in Tower Hamlets. It’s on until April 2019, and they’re also running a sketching club and have talks listed here. I’ve now visited, and I was impressed. I appreciate the time they’ve taken with the captions to tell us who the artists were, and what they were trying to achieve, as well as to locate the scenes. These are paintings showing a bygone era. There are two slightly up the stairs showing the (almost) original Bow Bridge before it was demolished and replaced in 1834. The bridge was built about 1110 and was widened in 1741 as there were big traffic jams of carts waiting to bring farm produce in from Essex. There’s also a painting of the junction of Parnell Road and Tredegar Road which is unrecognizable today. The exhibition is open Mon – Sat 9-5, with late nights on Thursdays until 8pm. On Tues it opens an hour later in the morning at 10am. The Archives are at 277 Bancroft Road, London E1 4DQ.